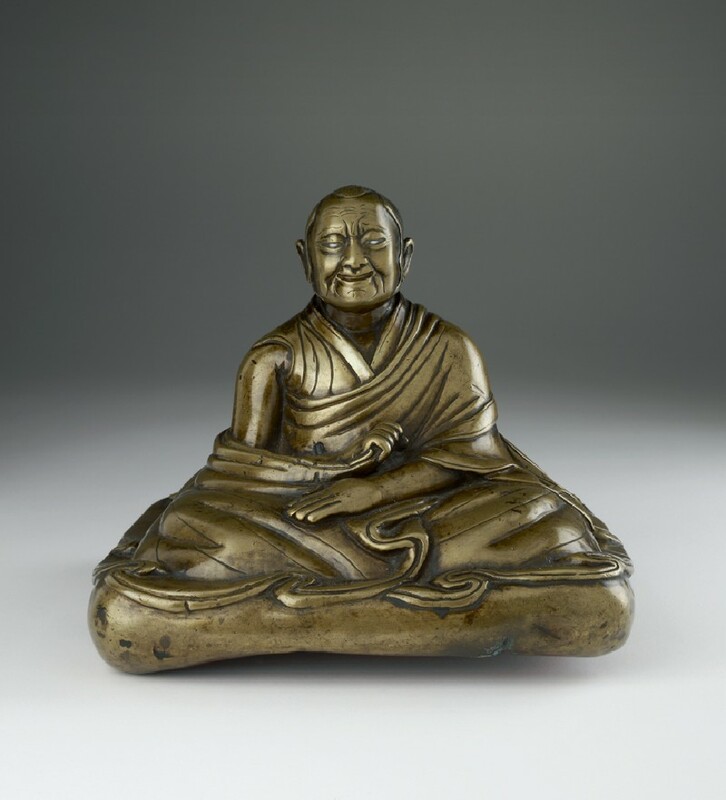 This small seated image is a portrait of a portly Tibetan monk, whose beaming expression of kindness is conveyed by his silver eyes and broad smile . The wrinkled brow gives us a sense of his concentration and concerned compassion. His receding hairline and heavy upper and lower eyelids are naturalistically rendered to show his age. His straight hair is indicated by very short striations and there are long side- whiskers in front of his ears. He pulls his outer robe around his waist, holding the edge in one hand; the other hand rests in his lap, on the lower portion of the robe. This realistic posture is very unusual because portraits of Tibetan lamas or monks customarily adopt a specific mudra to assimilate the individual with the historic Buddha: the most frequently represented mudra is the earth-touching gesture made at the moment of the Buddha's enlightenment, showing his steadfast resolve and equipoise at the moment of his victory over the attacking demons of Mara. The assimilation of the historic Buddha to the cult of the lama was practised particularly by the adherents of the Kagyu pa monastic order, as seen in the prabha centred on the lama figure (cat. 51). Amid the earliest such portraits, there is a painting of the founder of the Brigung subsect, made shortly after his death in 1217 . 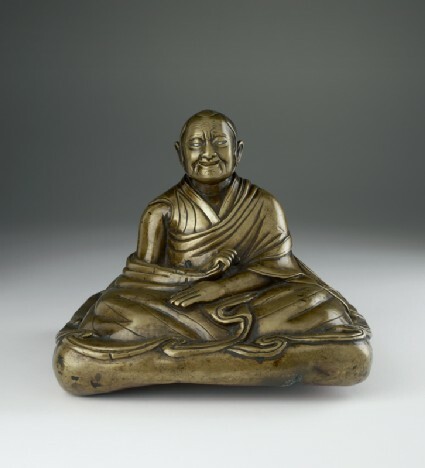 Among several small statues of monks of the Pagmo drupa subsect of the Kagyu monastic order, one of the earliest is the portrait of the illustrious monk Pagmo drupa (1110-70), the founder of the subsect. He is characterized by a corpulent face and body, with long side-whiskers stretching down to his very short beard, and as an incarnation of Sakyamuni he performs the earth-touching gesture . His disciples are often represented seated on simple bolsters, dressed in smoothly modelled monastic garments, with particular attention to the outer robe and elaborate folds in the back, as seen in this portrait image. This monk's robes are quite as elegantly draped in the front as well as the back. There is a great freedom in the folds of the robe, which seem to flow rhythmically like waves around the base of the image. The underside of the base is plugged with red material, possibly wax, indicative that it was opened at some time after the initial consecration and sealing. There is no inscription which might identify the monk or explain the circumstances in which the image was dedicated. When a portrait is made for the one year anniversary of a lama's death, it is customary to inscribe the image with the name of the lama to honour his memory and a prayer to generate merit for all sentient beings. The lack of such a dedication, combined with the life-like posture, tend to suggest that this portrait may have been made while the lama was still alive, as a personal image, a gift to one of his disciples. Although this image resembles the robes and stature of Tibetan monk portraits attributed to the thirteenth to fourteenth century, the hand gesture and facial features do not conform precisely, and its dating therefore remains tentative. 1 See Weldon and Casey Singer, The Sculptural Heritage of Tibet, pl. 33, for discussion of this image, attributed there to Tibet, 12th-13th century. 2 See Pal, Himalayas: An Aesthetic Adventure, pl. 132, for the portrait of Jigten Gonpo, painted after his death in 1217. 3 See the inscribed portrait of an enthroned Pagmo Drupa (h. 21.5 cm), copper alloy with gold, silver, copper, and gems, in the Cleveland Museum of Art: Weldon and Casey Singer, op. cit., pls. 51-2; for the biographical data and additional portraits, see Roberts, 'The Kagyu School', in Dinwiddie, ed., Portraits of the Masters, pp. 178 et passim.